In 1994, the Hog Wild was built for Jimmie Horning by Paul Mann Custom Boats. Hog Wild was intended for a life full of offshore sport fishing charters. 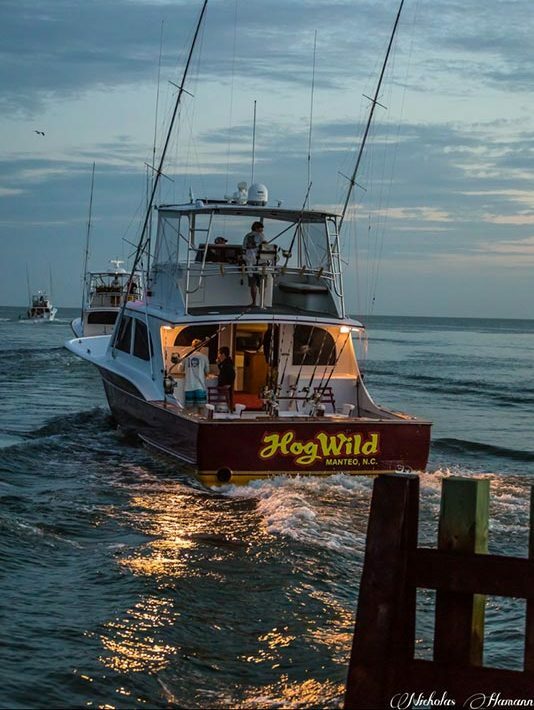 Jimmie dubbed the boat “Hog Wild” from his favorite football team’s offensive linemen, famously known as the “Hogs.” The Hog Wild became one of the most successful and well-known fishing charter boats on the Outer Banks. A family-owned boat from the beginning, the charter has held the same name and mission throughout its years of charter fishing. You will now find Captain Jimmie Horning Jr. at the helm. In 2018, The Hog Wild was modernized, renovated and equipped with the most up-to-date electronics. She is Coast Guard approved, and fitted with up-to-date safety equipment. The Hog Wild provides a comfortable, roomy, heated and air-conditioned cabin that includes a satellite TV, refrigerator for your beverages, and a full-sized bathroom. Hog Wild is powered by 850 horsepower twin 12.9 Cats that will transport you quickly and dependably to the Outer Banks fishing grounds. We depart from Pirate’s Cove Marina and make our way through to the famous Oregon Inlet, and finally out to world renowned Gulf Stream waters. Hog Wild Charters supplies custom built fishing rods, top-of-the-line reels, all fishing tackle and bait. The Hog Wild is child friendly and therefore a fun and unique option for an Outer Banks family vacation tradition! Experience the breathtaking deep sea fishing opportunity “Hog Wild” has to offer. For your ultimate Outer Banks fishing experience, book your trip now! Captain Jimmie was initiated into the world of fishing soon after taking his first steps. Jimmie’s childhood was spent fishing the Outer Banks waters for Bluefish and Spanish Mackerel. 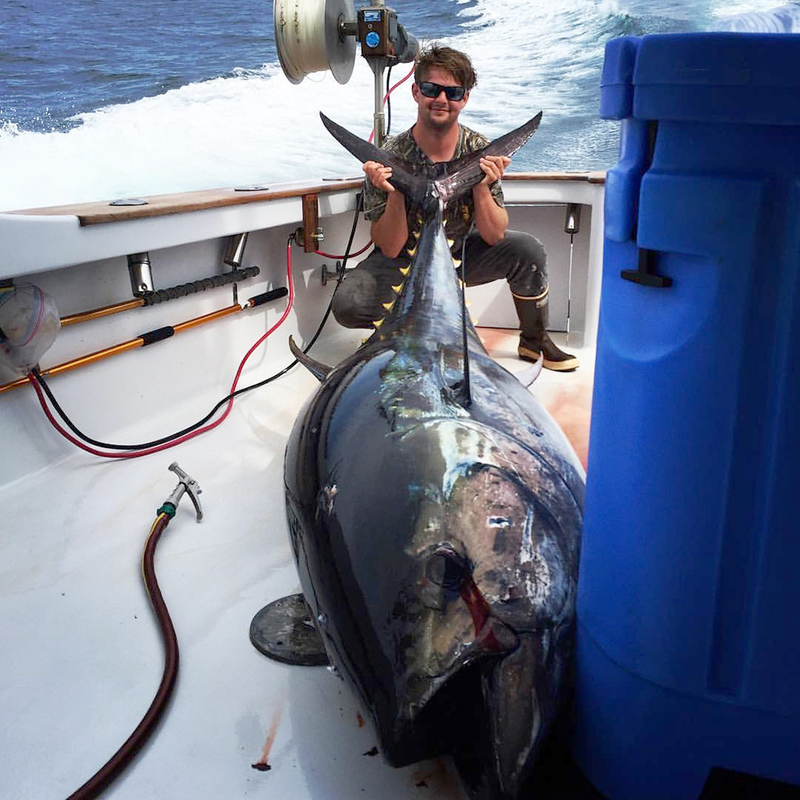 Jimmie spent two winters in the blue waters of Costa Rica fishing for Blue Marlin. He utilized this valuable experience when he returned to the Outer Banks and was recognized as Mate on the Hog Wild charter boat. At fifteen years old, Jimmie began taking charge on family fishing trips under the close watch of his father and captain, Jimmie Sr. In 2016, Jimmie Sr. yielded the stern to his son when Jimmie Jr. earned his Captain’s license. 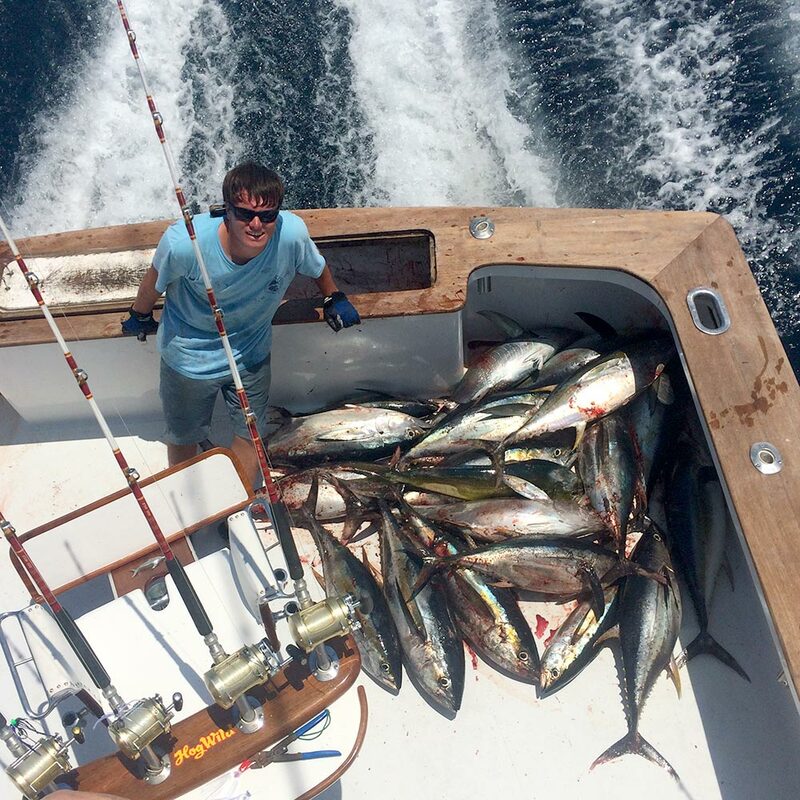 For two years Jimmie Jr. has enjoyed captainship, guiding both seasoned and new fisherman through the experience of Outer Banks charter fishing! It’s no surprise Captain Jimmie’s favorite fish to chase is the Marlin, or anything with a bill! Captain Jimmie is also a fierce competitor when Tournament time arrives. Trey has been Captain Jimmie’s “best mate” since childhood, so it only made sense he become First Mate as well! Like Jimmie, Trey was born and raised on the Outer Banks and has been working in and around the charter fishing industry docks for many years.